Since 2009, the "Buckeye Mission and Ministry Offering" (BMMO) has become a significant avenue for churches in the Region to support the ministries of American Baptist Churches of Ohio (ABC Ohio). 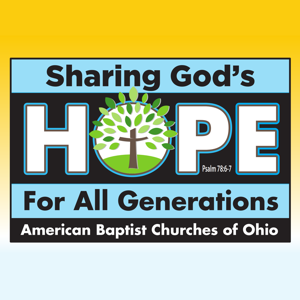 BMMO helps make it possible for ABC Ohio to serve your church. Every dollar given to the BMMO goes to support the various ministries that benefit your church (see the list of ministries below). The most significant region ministry is that of the two Executive Ministers, Rev. Jane Gibbons and Rev. Mark Click, who serve faithfully to help in whatever way needed to equip you and your church for ministry. The Region's theme for 2019 is "Sharing God's Hope for All Generations" from Psalm 78:6-7. "...that the next generation might know them, the children yet unborn, and arise and tell them to their children, so that they should set their hope in God and not forget the works of God, but keep his commandments..."
BMMO gifts help develop, coach, and assist servant leaders. It provides new ministry resources for local churches and helps provide quality ministry gatherings to challenge and grow healthy churches. Please consider giving to the BMMO in 2019. This is one way your church can partner with ABC Ohio to fulfill God’s mission in your community and beyond. Your faithful giving is appreciated and is needed to serve its member churches. Again, remember that every dollar given goes to ABC Ohio ministries that "help build healthy churches that impact the world for Christ." Region Ministry Team: The ABC/Ohio staff are experienced and prepared ministry leaders who serve clergy and churches as coaches and consultants in a variety of ministries including congregational transformation, placement, and ministry resources. Leadership Development: The Ohio Leadership Academy provides a three-year structured learning opportunity to increase and sharpen leadership and ministry skills for the local church. Student-Youth Ministries: With determination to raise up new generations of disciples and church leaders, ABC/Ohio provides a variety of opportunities including an annual youth convention, youth ministry leader training, and mutual support. Congregational Development – Transformation: With a commitment to congregational health, ABC/Ohio provides a number of resources to transform churches into ministries that will impact the world for Christ. Pastoral Placement: The ABC/Ohio staff uses proven and effective resources as they consult with church search committees to discern new ministry direction and call new pastors. 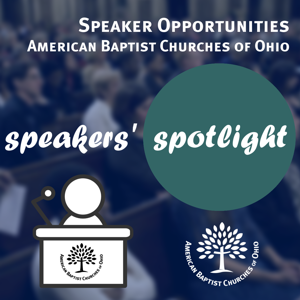 Ministry Gatherings: Several times each year, ABC/Ohio offers ministry gatherings that provide fellowship, inspiration, learning from nationally-known experts, and opportunities to increase ministry capacity. Ministry Resources: ABC/Ohio manages and awards ministry grants and scholarships for new ministries and outdoor ministries. The staff connects churches with cutting-edge ministry resources. ARMS: ABC/Ohio commissioned a team of highly qualified Associate Regional Ministers who have agreed to make monthly contacts with solo and senior pastors throughout the region, offering encouragement and providing prayer support. A Youth Ministry ARM is also working with staff to coordinate student ministries in the region. Additional ARMs will be added to the ABC/Ohio team as needed. In a letter dated March 1, 2019 and presented in person to the ABCUSA Board of General Ministries (BGM) Executive Committee at their meetings in Orlando March 13-15, Rev. Dr. Lee B. Spitzer announced his intention to retire from denominational leadership on December 31, 2019. Dr. Spitzer’s letter to the entire ABCUSA family was released March 14, 2019. Read the entire letter HERE! ABC Ohio is on facebook in addition to our web presence. Keep up with the latest news, events and information concerning ABC Ohio by clicking the "Like" button on our page. It's easy to find us! We have our own facebook address at facebook.com/abcohio.